WANT TO REACH PEAK FITNESS AND CATAPULT YOUR BODY INTO A FAT TORCHING FURNACE? 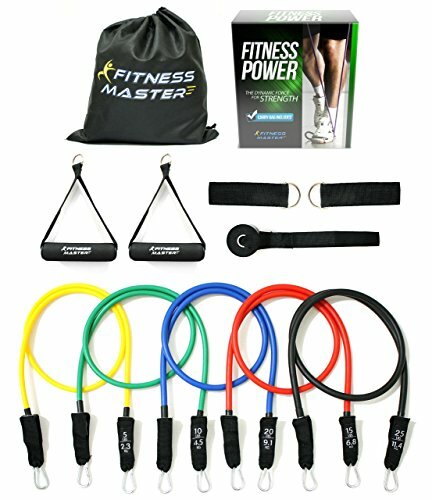 With Fitness Master’s Fitness Power, get stronger, improving your arm and leg muscle on every stretch using the complete gym inside the carry bag. 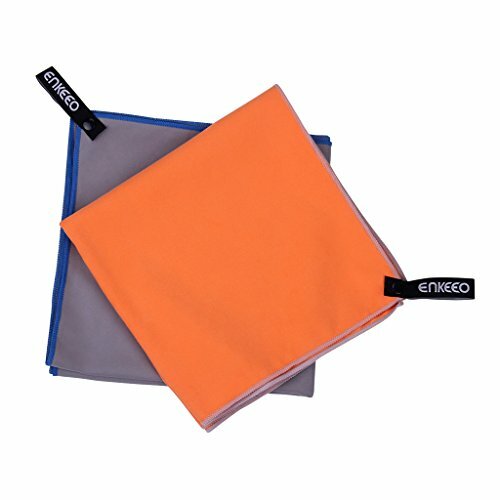 – 5 Color Resistance Bands: 5/10/15/20/25 lbs. 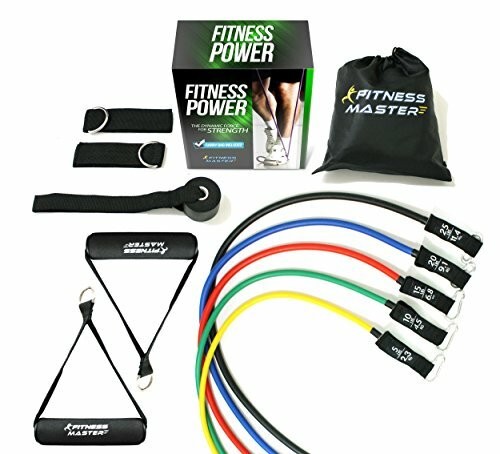 Fitness Power exercise bands set is the perfect tool for multi-fitness enthusiasts, beginners and professionals. With its compact size, it is easily portable and you can get your workout anywhere, whether you’re at home, travelling, or even in a hotel room! SO CLICK THE ADD TO CART BUTTON – You can get one for your buddy too! 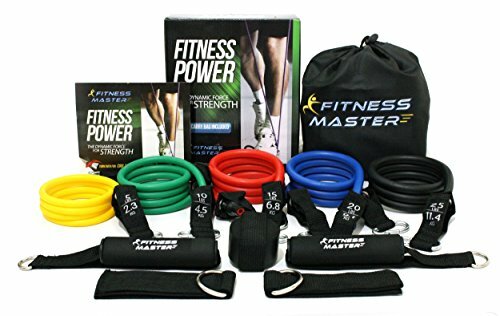 11 PC ANTI SNAP TUBE TECHNOLOGY – Fitness Power bands set consists of 5-Color Resistance Bands: 5/10/15/20/25 lbs, 2 Cushioned Handles, 1 Door Anchor, 2 Ankle Straps and a Carry Bag. GET THE ULTIMATE BODY WORKOUT – Fitness Power is best for Professional Adults – Men – Women – Children – Kids – Boys and Girls looking for an Effective Calorie Burning, Muscle Building and Fat Shredding Workout Program. 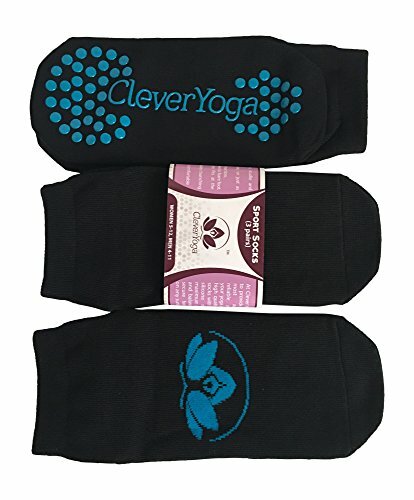 PREMIUM GRADE FOR MAXIMUM PERFORMANCE – Thick stretch bands of varying weight levels gives you the flexibility to customize the intensity of your workouts. PORTABLE AND LIGHTWEIGHT – With the included carrying case, you can take the “portable gym” with you! Whether you’re traveling or want to get in a quick workout while you’re at the office, Fitness Power Resistance Bands can go with you! 5 YEARS WARRANTY – If there are any issues with your product, simply contact us and we will give you a full refund AND send you a NEW replacement. You don’t have to return the product!